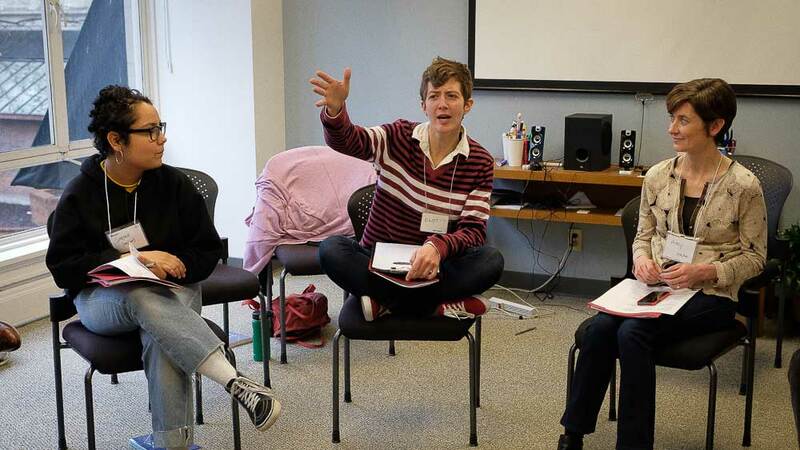 Oregon Humanities trains discussion facilitators to lead conversations about vital issues and ideas across differences, beliefs, and backgrounds. These discussions help build strong relationships within organizations and among communities. Our trainings will strengthen your skills to plan and facilitate conversations about the big questions that drive your work in the world both at work and within the broader community. During the training, you will participate in reflective discussions in large and small groups and deepen your knowledge of techniques to lead them. All participants have the opportunity to plan a conversation and receive feedback from trainers and other participants. We cap our trainings so that each attendee can receive the best hands-on facilitation experience. Each workshop is limited to the first twenty people to sign up. Scholarships are available to cover part or all of the cost of our trainings for those who are unable to pay the full amount. On the registration form, you will have the opportunity to request a scholarship and let us know how much you can contribute to attend the training. If you have questions about this process, email Rachel Bernstein at r.bernstein@oregonhumanities.org. When: Thursday, August 8, 2019, 8:30 a.m. to 5:00 p.m., and Friday, August 9, 8:30 a.m. to 4:00 p.m. Cost: $450. This price includes two days of training, breakfast, snacks, and lunch each day, as well as a facilitation toolkit and a book, Taking Action: Readings for Civic Reflection (2012), edited by Adam Davis, executive director of Oregon Humanities. Registration for this program will be available soon. When: Wednesday, September 18, 2019, 8:30 a.m. to 5:00 p.m., and Thursday, September 19, 8:30 a.m. to 4:00 p.m.
For questions, contact Rachel Bernstein, partnership and training manager, at (503) 241-0543, ext. 124, or r.bernstein@oregonhumanities.org. Oregon Humanities Facilitation Training is made possible in part thanks to the support of the National Endowment for the Humanities and the Oregon Community Foundation. We can provide them when asked for them. Do you receive a certificate of completion at the end of the training? We held these trainings in Bend and Medford this past year and we are always looking to schedule these trainings in different places. We plan to host a training in La Grande in 2019. Dates and locations will be up on our website as soon as we have them! Why does most everything have to be in Portland ? Some workshops only require a instructor. I live in Wallowa, Oregon. There are people here who would so benefit from trainings, such as you offer.